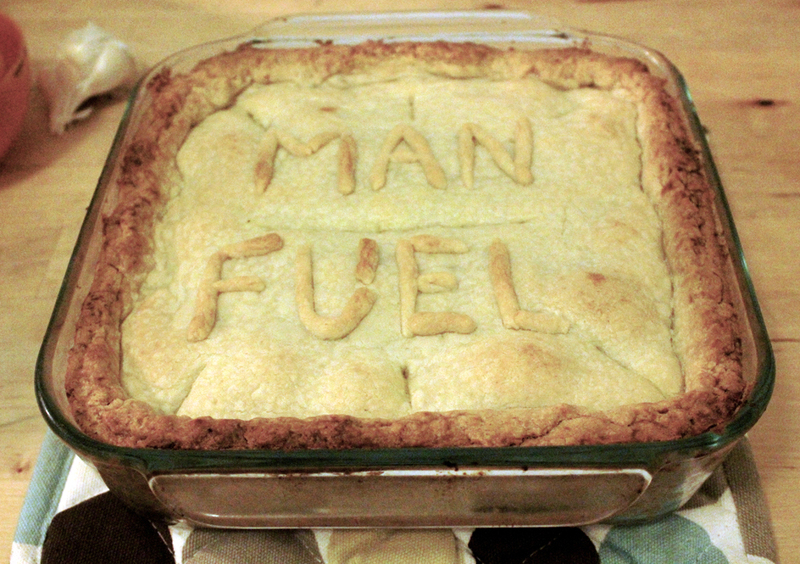 Man Fuel: I’m thrilled to announce yet another Guest Post! This time from Marisela Navarro. She is a pharmacist, turned writer. Although, maybe she’s always been a writer considering that she’s been writing since she was just a little girl. You can view some of her work on her own blog simply named, “Write,” where she often critiques stories she wrote as a child (with pictures!) and discusses life as a writer today. Marisela is also my friend Double Down’s girlfriend who has also submitted a recipe for my blog. You can find his Chiles Rellenos Recipe here. In writing this post, Marisela has adapted a recipe from the Trader Joe’s website (credited below), so for the first time, I am also going to classify this recipe as a review as well. Lastly, you have to check out the picture she took below. This easily wins best photo on the Man Fuel blog! Amazing! Marisela: Often I am frustrated and daunted by cooking. I really just like being cooked for. Fortunately, since I don’t have kids I’m responsible for keeping alive, and my boyfriend does get enjoyment out of cooking, I’ve escaped the task scot-free. Unfortunately, I feel guilt for my lack of contribution, so here’s a recipe I’ve made over seven times to ensure my boyfriend keeps loving me. Makes 6 – 8 servings, about 560 to 746 calories per serving (4,481 calories total). I counted the calories myself, but my math skills are excellent. Note: TJ’s organic foursome vegetables is just a mixture of sweet peas, sliced carrots, green beans, and white corn (for those who don’t have a TJ’s). Microwave Organic Foursome and pearl onions for 1 minute on high. Mix flour with curry sauce. Add vegetables, chicken and curry sauce mixture to bottom pie crust in pan – spread evenly. Top with pie crust. Seal and trim off excess pie crust. Cut vent holes. Man Fuel Note: If you have extra pie crust, go ahead and make weird shapes, designs, or even write something on the top of your pie with it like Marisela did! Bake for 40 minutes. Cool for 10 minutes. As I’ve said, I’ve made this over seven times, so I’ve played around with the ingredients. Typically, I add more than 1 cup of vegetables. I’ve used other curry sauces as well, but I do like TJ’s Thai Yellow the best. I’ve also substituted leeks for the pearl onions, and that came out great. And I’ve made my own chicken. It’s important to note that TJ’s Just Chicken is already pre-cooked. This recipe is low-stress and brings much happiness to the household. Nice. This recipe reminded me of a fusion-y Vietnamese chicken curry pot pie. Will have to look for the link. Clearly have to incorporate that photo into your blog banner. Yeah, it does look good. The link to the original recipe is actually in the credit line. Yeah! It totally made my day. What’s up, I check your new stuff like every week. Your story-telling style is witty, keep it up!